Acton Elementary School placed first in a school grant contest that aims to further STEM curriculum in Maine schools. Upon winning first place in an annual school grant contest, Acton Elementary School in Acton, Maine is receiving a $10,000 grant to advance a hands-on robotics course for students. 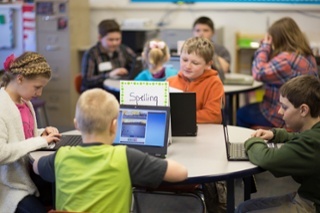 The school grant contest from Kepware Technologies, a software company, aims to advance STEM education and workforce development in Maine. In its third year, the contest received numerous proposals from educational programs and selected Acton’s proposal for a robotics course. Eiléan Worcester, the school’s office administrative assistant, submitted a proposal to purchase of VEX Robotics Kits that were needed for the school to implement Project Lead the Way (PLTW) Launch curriculum. The activity and project-based STEM module includes a hands-on robotics course for fourth and fifth graders where students use the kits. However, the school was unable to purchase these supplies with its remaining budget. Without the kits, Worcester said that she thought the school would need to delay the introduction of the robotics course by a year. “Now, with the funding from Kepware, our tiny school is set to make a big impact,” she said in a statement. “Not only will these kits help foster robotics and STEM knowledge in our local community, but it will also help supply Maine's future workforce with creative problem solvers and strategists." Rachel Driscoll, the school’s first instructional coach who will help lead the PLTW curriculum, said that it is challenging for students to learn about robotics through reading a textbook. “These kits will enable our students to fully explore the ways robots are used in today's world through hands-on projects and engaging exercises,” she said in a statement. “Both the students and the teachers are eager to get started." Acton Elementary School will begin the new robotics curriculum in September 2017. Further information about the curriculum is available on the PLTW Launch site and details about the grant program is available on the Kepware site.